Running your generator efficiently is the key to ensuring its longevity and avoiding unnecessary downtime. Things like light loading a generator or neglecting scheduled maintenance can lead to unexpected operating costs, excessive wear and increased emissions. Load bank testing is particularly important with prime power, Tier 4 generators. Most importantly, though, regularly scheduled maintenance will help to make sure that your generator is ready when it’s called upon. For some applications, such as data centers, blood banks and hospitals, emergency power generators simply can not afford to fail. That’s why preventative maintenance techniques like load bank testing are vitally important. In fact, load bank testing is a mandatory requirement for some backup power generation applications. Emergency power generation systems fall under a number of regulatory oversight conditions and code requirements. The National Fire Protection Agency (NFPA) and the National Electric Code (NEC) have both drafted rules which pertain directly to the load bank testing of emergency generators. So, what is load bank testing and why is it done? Load bank testing involves firing up a standby or prime power generator and running it under an artificial load at its maximum capacity for a specified period of time. During load bank testing, data can be recorded that offers a more thorough look into the health of the gen set on the whole. The test verifies that the generator is capable of handling incrementally higher kW loads, that it is still capable of accommodating its maximum specified load, and that it can work for an extended period of time. So, at its simplest, load bank testing is a way of verifying that your standby or prime power generator is still capable of kicking on and operating at its maximum kW output. But load bank testing is much more than that, and one of the most important reasons for performing load bank testing has to do with the problem of wet stacking as a result of light loading. We’ll provide a brief refresher on light loading here, but for a more thorough rundown of the phenomenon, check out our post about it here or download our guide to running your generator efficiently through the form below. Light loading refers to the practice of running a generator at less than its possible maximum output capacity. Since every generator has an optimal workload-to-fuel-consumption sweet spot, light loading results in decreased efficiency and can lead to the buildup of unburned fuel in the exhaust of the engine. This potentially hazardous buildup is what is known as wet stacking. Wet stacking can reduce a generator’s maximum power output, increase its emissions, make the generator a fire hazard and require more maintenance than a healthy generator. Beyond simply ensuring that a generator is capable of performing as specified, load bank testing also helps to combat wet stacking. When running at maximum kW output, the temperature and pressure within the engine increase to levels not reached when running on a lighter load. These extremes help to burn off the fuel and soot deposits that have built up in the engine’s exhaust chamber as a result of light loading, effectively healing the generator of the damages of light loading. 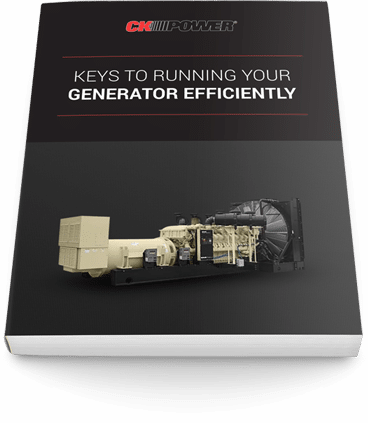 For more information on running your generator efficiently—and guaranteeing it a long life of high performance—download our guide through the form below.